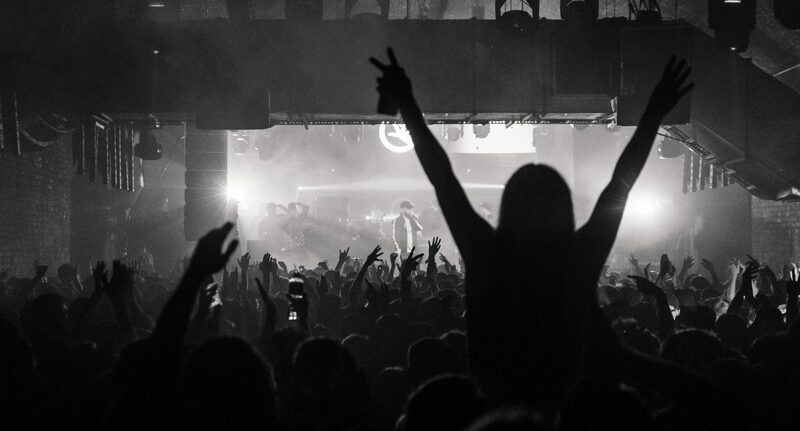 With just four weeks left until the end of Store Street, and in what was one of their last ever shows (probably), Beats, Grindah and the rest of the Kurupt FM team, took The Warehouse Project by storm on Thursday night. Following the tremendous success of the fifth and final series of hit mockumentary, ‘People Just Do Nothing’ and with plans for a film and US versions of the show in the pipeline, Brentford’s finest pirate radio station put on a night the sell-out Store Street crowd will remember. Enlisting the help of some famous friends and more underground artists, Kurupt curated a night true to their trademark sound. Genres like garage, grime and bashment unsurprisingly dominated the event. Over the course of 7 hours, and across 3 rooms, crowds witnessed big sets from the likes of dub legend, David Rodigan, grime hero, Ghetts, and famed producer Sir Spyro. It was Spyro who kicked the night off in fitting style. His set followed an impressively energetic one from fresh grime upstart Capo Lee. Capo’s recent singles have drawn widespread attention across the scene. After the trademark ‘sound of the sir’ tag announced his arrival at the decks, Spyro launched into a blistering set. He mixed old-skool garage classics with some newer grime sounds. As a regular resident at Rinse FM, Radio 1 and 1Xtra, and boasting production credits on some of the biggest grime tracks of recent years (see Stormzy’s ‘Scary’ and P Money’s ‘10/10’), his set reflected a wealth of knowledge about the UK’s underground scenes. It wasn’t long, however, before the unmistakable figure of David Rodigan took to the stage in Room 1. Recognisable, not only through his famous choice of hats but also his questionable Jamaican patois. Rodigan is something of a reggae and dancehall icon of the most surprising form. An illustrious radio career and an impressive soundclash record has seen him develop a truly crowd-pleasing set. Dropping tracks like Kano’s 2005 anthem ‘P’s and Q’s’ into a set mixing dub beats with 90s hip-hop and garage, Rodigan acted as the perfect hype man for Kurupt FM’s prime time set. Kurupt FM’s set, although disappointingly short at only 45 minutes long, was exactly as expected. Every member of the now world-famous group took to the mic either to spit a few bars or hype the crowd up. Of course, sometimes in, their classically painful cringe-worthy style. The live set effectively brought the on-screen chaos into real life. Rifling through the garage and bassline rhythms one would expect to hear, tuned in to 108.9FM, the night hit something of a climax as DJ Decoy spun fan favourite ‘Suttin Like That’ off 2017’s The Lost Tape. With Grindah, Steves and the new face of British Airways, Chabuddy G, inciting what felt like a riot at the front the crowd, it was clear that this was no regular WHP event; it was a real Kuruption Ting. As they, and the show which made them famous, continue to grow almost exponentially, it’s difficult to see any sign of the Kurupt FM team slowing down. However, if I choose to believe this is actually the ‘last tour ever,’ then I’m excited to see what’s next.